I am blessed with quite a few empowering experiences this month, getting me out of a state of lethargy and helplessness that I suffered from most severely this March. An empowering experience can be attending a candlelight vigil with over one hundred thousand people to remember the June Forth Massacre twenty years ago. 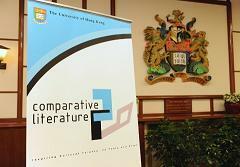 An empowering experience can be a dinner with alumni of Department of Comparative Literature, and working with a great team and liasing with alumni to prepare for the Department's 20th anniversary [Link]. As I wrote for the 20th anniversary booklet, "Their enthusiasm, affirming the value of what we have being doing, gave me much energy to continue working on this project and also promoting this discipline to the wider public." An empowering experience can be re-union dinners with my university-mates and my classmates in the M.A. programme. An empowering experience can be an encounter with inspiring and determined individuals, in reality and in the cyber world. You may be one of them. I am so obsessed with this word "empower" this month that I have suggested it for the strapline of a project [Link] which I am working on in office. Despite my chaotic state of mind, I at least feel that I am living my life again. Bit by bit I am regaining the drive and ability to do things that were once my usual practice - writing, reading, seeing exhibitions, watching movies - though they now require much extra effort. But I am already grateful.